One of the reasons why we struggle to read the Bible for all it’s worth is because many us don’t even know who the Bible is really about. We need to learn to read the Bible as a book about God, not a book about us. This might sound elementary, but often times I come to God’s word wanting to know who I am and what I should do. It is not that I don’t want to know anything about God, but my flesh’s tendency is to want to know about myself first and then figure out who God is from there. We are such self-focused creatures. It is no surprise that we face studying the Bible with a mindset of self-exploration, self-discovery, and self-fulfillment – especially in a culture where everything is so focused on independence and becoming “your best self.” In a culture like ours, there is such a huge temptation to think of the Bible as merely a self-help book. However, until we learn to focus our attention on God when reading his word, we will be left unchanged. There is no true knowledge of self apart from the knowledge of God. The Bible is a book about God, not us. In addition to this, we must learn to allow our minds to transform our hearts. Mark 12:30 says, “And you shall love the Lord your God with all your heart and with all your soul and with all your mind and with all your strength.” As women, I think we subconsciously focus on the “loving God with all our hearts” part of this verse. This is certainly not wrong, because it too is a command from the Lord. But oftentimes we can wrongly define the health of our relationship with God by how close to God we feel in any given moment. Allowing our feelings to lead our faith often causes us to have a very inconsistent relationship with Christ. So one day, I have what I consider to be a good “quiet time” in the morning, and suddenly me and Jesus are totally cool and I am on top of the world. Then the next day, I have what I consider to be a can’t-even-keep-my-eyes-open kind of quiet time, and now I am not even sure if I’m saved. We have this completely backwards. It is much more natural to attach feelings to our faith in Jesus, than it is natural for us to attach our intellect to our faith in Jesus. So this is something we must be aware of as we enter into our time with Jesus. Our emotions are definitely not called to remain unchanged to the person of Jesus, but we are much better off if we allow our mind to lead our heart as it can be dangerous for our wavering heart to lead our mind. Scripture supports this concept throughout both the New and Old Testament. We see God in his word affirming the use and devotion of our mind in the ways we love and follow Christ. Rom 12:2 clearly shows that the path of transformation runs from the mind to the heart and not the other way around. Our mind must be renewed. We must know with our minds in order to discern was is good and acceptable and perfect. Are we denying this truth from scripture by the way we go about studying the Word? Are we engaging scripture with our minds so that we can be transformed? Engaging scripture does not just lead to transformation, but it leads to the delight. The blessed man from Psalm 1 delighted in the law of the Lord because he meditated on it day and night. This isn’t a meditation that seeks to empty the mind like we see in many Eastern cultures. The focus of Christian meditation is not to empty the mind, but to fill the mind with God’s truth so that we can be changed. In order to find true deep delight in God, like the blessed man of Psalm 1, we must KNOW God with our mind. RC Sproul says, “Nothing can be in the heart that is not first in the mind,” and Jen Wilkin says, “The heart cannot love what the mind does not know.” Again, walking away from reading God’s word with a joyful heart is a beautiful thing, I don’t want to demonize emotions here. Joy in the Lord is our goal, but we don’t want to ignore the mind’s understanding in our pursuit of joy. Jen Wilkin, in her book “Women of the Word”, talks about a PhD professor at Yale who specializes in pleasure research. Wilkin describes the professor’s discovery and acknowledgment of the “mind-before-heart connection”, meaning that pleasure results from gaining knowledge about the object of our pleasure, not from just experiencing the object over and over again. This fascinated me because I know that pleasure is one of my deepest desires. We all want to find delight in something. In God challenging us to know him with our minds, he is in no way ignorant of our desire for pleasure. He created us and he knows that our knowledge of him will lead us into pleasure. In fact, there is no way for our desire for pleasure to be satisfied without knowledge of God. We must know him in order to delight in him. Some of you might feel like this has been helpful, but are worried that even after making these changes you still might not delight in God’s Word. What then? The Gospel is good news for you. Even when we fail, if you are in Christ, Jesus has already paid for your sin of failing to delight in his word. There is no condemnation in Christ. But I hope that this grace which forgives you is what would lead you back to his word in obedience to try again each day. I hope also that you would grow in your understanding of God’s delight in you. The Gospel message is that God so loved the world that he sent Jesus to die for us. He so loved the world — he delights in us! You’ll never delight in God’s word until you delight in God. And you’ll never delight in God until you believe that he delights in you. We love because he first loved us. The Gospel of God’s delight in us is what motivates us to run to him in his word, and it is also what catches us when we fail to do so. 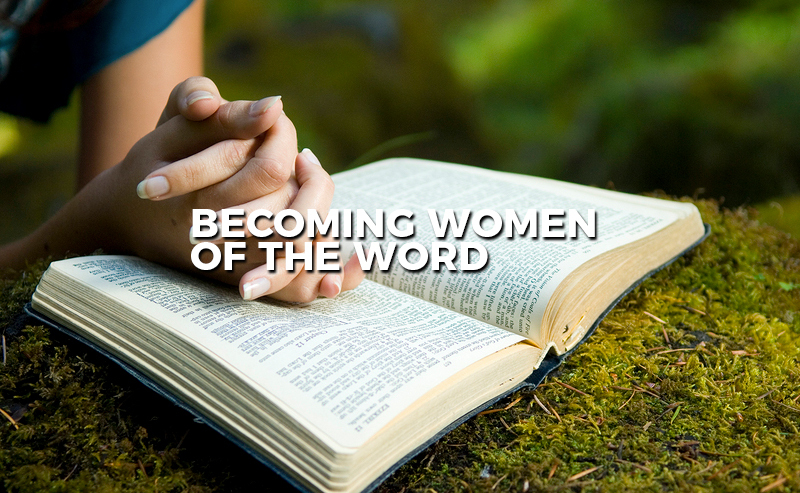 I deeply desire that we would be women of the word. There is much much more that can be said about growing in the discipline of studying the Bible, and I know I have barely scratched the surface. But I think if we really challenge ourselves to focus on the Bible being a book about God and allowing our minds to transform our hearts, we would be on a great track to being women who delight in his law and would find ourselves meditating on it day and night!